*1PCS RF garage door controller receiver switch module + 1PCS remote controller. With small size, take up very little space, work in a multitude of different systems. *Stable and reliable performance, high receive sensitivity, low power consumption. Very convenient and safe to use, simple wiring diagram connection way. Easy operation. *Support remote control up to 20 pieces. The working mode can be changed by yourself: you can switch to momentary, toggle, latching three modes as you need. *Widely used in our daily life. 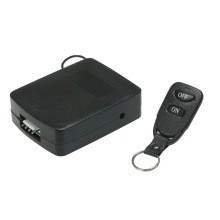 It can connect to the access control system, garage door, light, electric curtain, household appliances, electrically operated doors, motor control, water pump, lifting equipment, security system, etc.